My friend came back from Japan more than a week ago and came over to my place for a baking session. It is funny. We were really close friends back in Secondary school but we went to different schools after that and weren't exactly in touch. I can't exactly remember how we got in touch again after leaving school. Thinking back, that was 18 years ago when we first knew each other! No wonder I need to upgrade my face moisturiser to "Repairwear" range! Somehow we got in touch again in recent years ( I think it's thanks to Facebook!) and somehow baking came into the picture. She is currently enrolled in a culinary school in Japan *envy envy* and seems to be enjoying her classes. So she came, armed with her recipe from school and we made cream puffs (fancier name: choux a la creme just as they had taught in her school). I had an earlier attempt where I made cream puffs using Pierre Hermes recipe. I did not post the recipe but you can easily search from any Daring Bakers' blog in google. I do not have my friend's recipe. Even if I do, it is from her school, I do not think it's nice of me to post it. To me, I am not quite able to tell the difference between her school's recipe and Pierre Hermes', yeah my taste buds are that lousy. They both taste good! 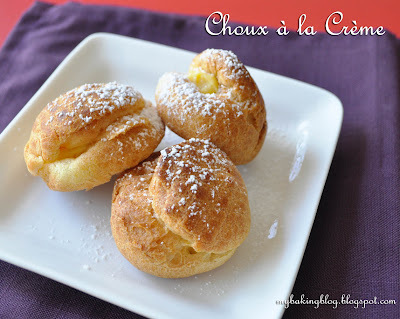 Light and puffy, just like cream puffs should be. Other than the puff, what goes inside is just as, if not, even more important. There are places that sell cream puffs with whipped cream and I think that is a lazy shortcut method. I like cream puffs that are only filled with pastry cream. I can accept pastry cream added with whipped cream to lighten it a little, but just not whipped cream alone. Since I wanted to save my vanilla pods for my little project which is coming up, we used vanilla bean paste for the pastry cream instead. That is a good vanilla bean paste too with all the vanilla seeds in it, but of course, the pod would have been a little more fragrant. 2 weeks are going by in a flash and she will be back in Japan soon. Not sure when we will have the opportunity to bake together again, but the refrigerated cream puffs sure smelt and tasted so good! YUM!! I've tasted pastry cream in cream puffs for the first time months ago and LOVE IT!! It tastes soooo good!! Especially with the vanilla bean! !